Very beautiful n fine handmade work plate natural n pure white stone very fine carved net inlay semi gems stone work. 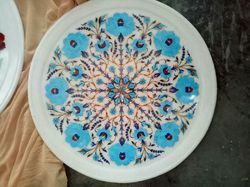 Marble Inlay Plate, a symbol of TAJ and the real hand made crafts. Inlay available in stone inlay, marble inlay, inlay plates, inlay vases, inlay decoration, marble inlay decoration and marble table inlay. We are offering Marble Inlay Plate to our clients. 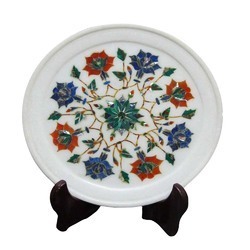 These plates are inlaid with semiprecious stones in various floral designs.These decorative marble plates are made of high quality marble and can be used to decorate home interiors or to gift as well.